Hey everyone, this Friday is 2nd Friday Night Out – Mesa! We will be setting up out front of ‎Gotham City Comics like always! 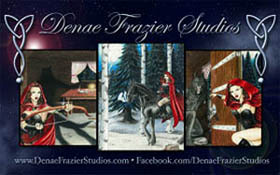 We will be selling Denae’s 6.75”x10.5” and 11”x17” LE prints and Original art at the event. Have a great week and we look forward to seeing you there! This entry was posted in appearances, art, events, news and tagged 11x17 LE Art Prints, 2nd Friday Night Out, 6.75x10.5 LE Art Prints, Art, Art Prints, artwalk, Downtown Mesa, Gotham City Comics, Mesa, Original Art, Spring Break. Bookmark the permalink. Trackbacks are closed, but you can post a comment.